DIY 737 Throttle Quadrant - Time For Some Housekeeping ... | Life, The Universe and ... Everything! My 3D printer went bust last Friday ... it's fixable but I have to wait for parts to arrive. So the whole weekend has been spent suffering from 3D Printer Withdrawal Syndrome. Meanwhile, an idea came to me on how to better edit the 737 Throttle Quadrant body. Earlier, I had imported the original 3D model by thingiverse user jamang1999 (https://www.thingiverse.com/thing:725470) into TinkerCAD where I planned to slice and dice it into smaller pieces so that it could easily be printed on a 3D printer. The way I ended up doing this in TinkerCAD was two add some large "hole blocks". So by moving these "hole blocks" around, I was able to cut the entire thing into over 30 smaller pieces. I wrote down the exact position of the "hole blocks" for each of those 30 pieces. I stored the STL files for each piece in a git repository. Now whenever I made changes to the design, I would have to figure out which piece was affected, and reposition those blocks around to "cut" the part again. This was extremely tedious, especially when a change affected multiple parts. I also found it quite hard to relate the 3D model with the individual pieces when making changes. It's possible to temporarily "hide" the "hole blocks" while editing, but it was tricky to position changes as you do not want to make a screw hole that sits across two pieces for example. Now it is very easy to see which parts are affected by my changes. And when a part is affected and I want to reprint it, I can just click on it and export that part as an individual STL! No need to reposition those "hole blocks" and get their positions exactly correct any more. 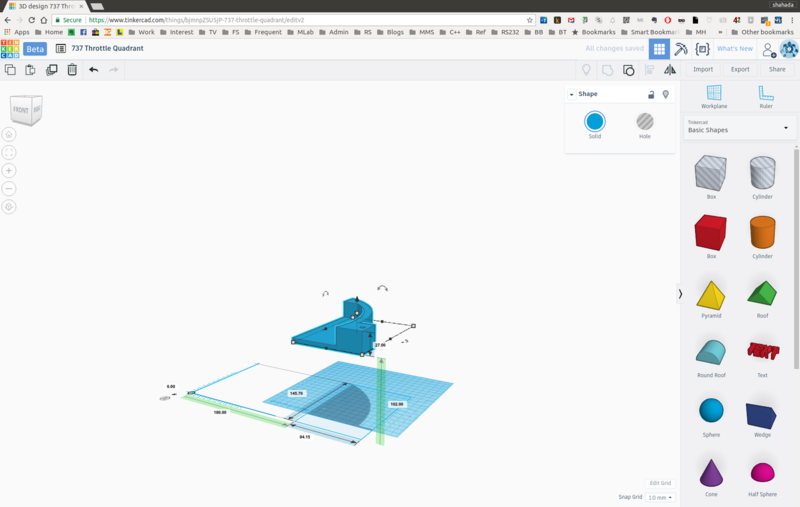 With this I've decided to drop the git repository and just maintain the tinkerCAD design as my working copy for everything related to the 737 Throttle Quadrant. I will try to maintain a history of changes via the Group/Ungroup feature, so it should be possible to see the changes by repeatedly hitting the ungroup button. 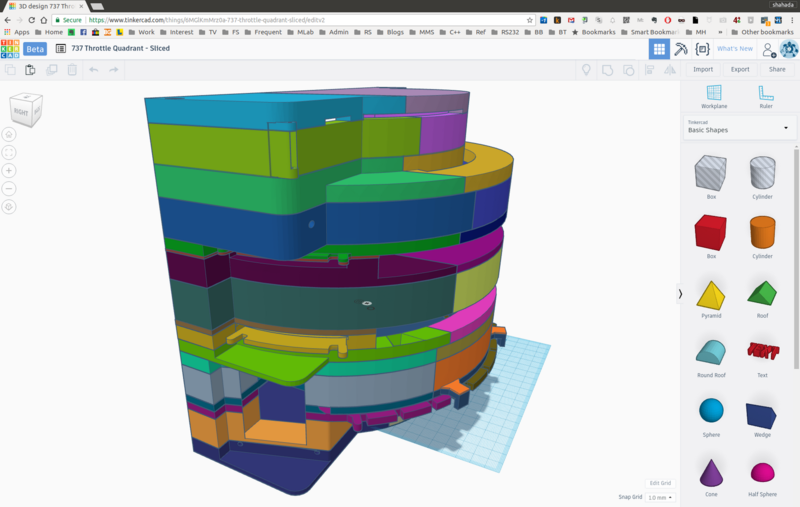 I will post a summarized change log in the comments section in TinkerCAD, with more details on the blog here. 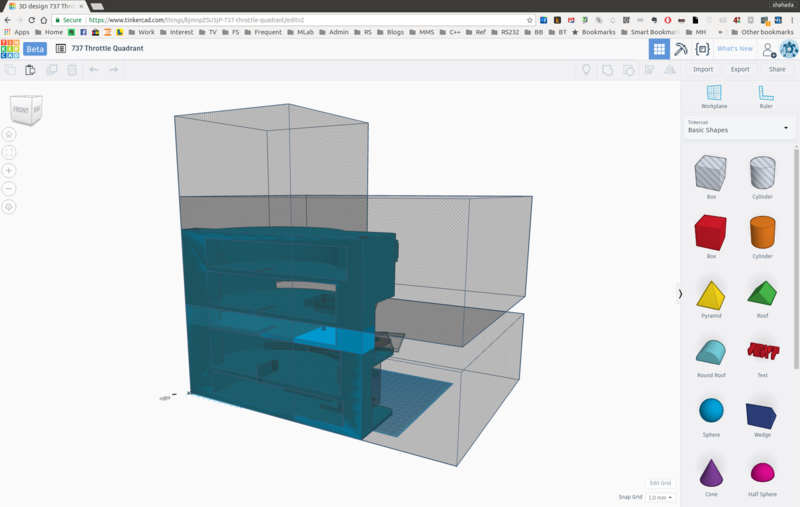 If you're planning to print any of these pieces, bear in mind that some will need to be flipped over in your slicer software to avoid the need for supports. I've set the zero point of all three axis to be at the rear right hand side (flap lever) corner of the unit. This is done by setting the ruler to "Use Endpoint" mode, doing a "Select All" followed by setting the X and Y offsets to 0. This is what most of the measurements I describe will be offset from. The Throttle Body alone weighs just under 1.5 kg (around 1 and a half spools of filament). This is not including levers and other accessories. The cut out where the 6mm Center Shaft goes into is a 7mm hole centered at X=126.50 Y=30.50, with a 31mmx7mm guide slot below it. I was able to buy a 6 foot long M6 threaded rod from my local hardware store (they call it a "stud"). It cost me only MYR2.50. I cut them into smaller lengths using a cut-off disc on my RTX rotary tool. This is used for the Center Shaft (256mm), where all the levers mount to. I also got some M6 nuts and washers from here. There are two holes that the front and rear run along the width of Throttle Quadrant. I used an M6 threaded rod here (230mm) to join all the slices of the throttle quadrant body together. It has the advantange of being removable. It's also useful to have some M6 locking nuts. I grabbed a bundle of 50 pieces for USD2.08 off eBay. I used Selley's Supa-Glue to glue the parts together. A few large drops worked better than spreading out a thin layer, with overnight drying. Glue front and back portions of the same slice, but avoid gluing slices together unless really necessary -- at least not until you've done a dry fit of all the components.